Denise Perrier and the full band hit the stage at 5:00 PM, following earlier acts including the fabulous V-Note Ensemble (at 3:00). Head on over to the Bayview for a great outdoor swinging afternoon. What better idea for a holiday gift than tickets presented to your family and friends for January 4th with the Juniuses? The Junius Courtney Big Band featuring Denise Perrier begins the 2017 jazz season with a philosophically swinging launch to the new year. Pack up the tinsel and pull up to the bandstand for a night of new beginnings, new tunes and new dreams. Denise Perrier, vocalist par excellance, recently returned from Russia, sets up our New Year’s State of Mind. One of the swingin’est bands around stirs it up, and propels into a new take on 2017, whether you’ve made any resolutions or not! The band gets down to honor these stalwart members in style. The Junius Courtney Big Band featuring Denise Perrier welcomes special guest Bobi Cespedes for a night that promises ultimate musical excitement and spirit. Advance tickets are highly recommended at $20. Tix at the door: $24. SENIOR DISCOUNTS! Also, those 18 and under get half-price tickets. Afro-Cuban songstress Bobi Cespedes is a singer, songwriter and performer who leads the pantheon of Bay Area Afro-Cuban musicians. She has a devoted following, and is appreciated for her innovation and heart. Bobi’s creativity is augmented by her previous work with Mickey Hart and Conjunto Cespedes. As the Junius’ special guest, she’s bringing the Cuban big band vocal tradition to Berkeley, with love. There will be reflections of Beny Moré and romance. World-traveler and world-class vocalist Denise Perrier is recently returned from performances in Cuba, and more recently returned from the Vladivostok Jazz Festival. A member of the Junius Courtney Big Band for fifteen years, Denise exudes soul, sass, class and most formidable chops. At the Freight, she’ll be recalling the exuberance of her international performances to deliver a swinging tribute to the Latin tinge, Cuba and her own blues-drenched roots. The Junius Courtney Big Band is celebrating its fifty-five-year anniversary, and is pleased to be returning to the Freight for another night that will lift off to delirious realms of swing…and percussive Afro-Cuban and Latin grooves. Contact the Freight at: 510-644-2020. With Dee Spencer on piano, the band presents a brand new show, now in the works. The Full Dance Floor will be Open! Great snacks and drinks. All ages welcome. $2.00 discount for Seniors; half-price tickets for those 30 and under. The full band featuring Denise Perrier returns to YOSHIs Oakland for our twice-yearly appearance at one of the best jazz clubs around. Plans are still brewing for this event, but get it on your calendar now. What better way to gear up for the transition from summer to Bay Area Autumn than a night pulled up to a bandstand loaded with swing? With over 15 years of appearances at the Freight - from dance nights to special concerts celebrating Billy Strayhorn and Earl “Fatha” Hines - the Juinus Courtney Big and has been raising the roof. Grab your dancing shoes, your partner and head on down! Ebullient vocalist Rhonda Benin steps in as featured vocalist, bringing her sass and soul to the proceedings. No stranger to the Freight (most recently as producer and performer of her packed-house “Just Like a Woman” all-star revue), Benin has impressive chops and a resumé to match, with appearances at SFJAZZ, Bay Area jazz festivals, Hangzhou, China and Rwanda on her list of credits. Benin is a long-term member of Linda Tillery’s Cultural Heritage Choir, and has also appeared with performers including Wilson Pickett, Odetta, Al Green and Patti Austen. Rhonda’s terrific show “Just Like A Woman” recently packed the house at the Freight, and you’ll want to catch her with the full band propelling her! The Junius Courtney Big Band has built a repertoire over fifty-plus years that is unique and deeply swinging. This June’s outing at YOSHI’s showcases sparkling arrangements, glittering delivery and the richness of some crown jewels from the band’s book. The band stirs in a dose of magic and down-home blues feeling that swirls up from Junius Courtney’s New Orleans roots. Join us for jazz that’s high-brow AND low-down: a potpourri, jambalaya, sacred and profane eclectic mix. See what happens when this band of “veterans who know how to tell a story in eight bars” dresses up, gets down and cuts loose. The fabulous vocalist Denise Perrier, recently returned from engagements in Cuba, sports her own tiara to deliver the sublime and the gritty. Denise and the band will put a spell on you! Denise and the band return to this great location for a swingin’ evening by the Bay. Great views, great sounds, great company! The Junius Courtney Big Band with Denise Perrier headline the Gala Opening of the restored California Theatre, hosted by the Pittsburg Arts and Community Foundation and the City of Pittsburg. From its original opening in 1920 to the last ten years of planning and renovation, the gala heralds a new life for this fabulous beaux-arts building. "Latin + Swing = Junius" Big Band Dance! The full dance floor will be open! The Mambo, the Rhumba, the Bolero and t he Cha-Cha-Cha will swirl through the band's delirous realms of swing. The band with Denise Perrier is pulling out all the stops with a special invitation to dancers for Saturday-night-date-night. Check out the band's singing coro's and some new tunes from Denise, too. Get out your dancing shoes, put on your finery and bring your dance partner to celebrate the launch of the band's second half-century. Plenty of comfy seating, too. half-price tickets for those 25 and under. The Junius Courtney Big Band featuring Denise Perrier brings our new show "Monk Meets Junius" to the best jazz club around. We're returning for year five of our twice-yearly YOSHIs appearances, planning once again to pack the house and raise the roof. The fabulous Denise Perrier is out front on vocals. Sophisticated favorites from the band’s book combine with Monk’s big band charts. This all promises to bring the musical excitement to a boil. Thelonious Monk was one quirky genius who left us a catalog and legacy of truth, beauty and humor. We'll put a Junius Courtney Bg Band spin on some charts designed for Monk's own Town Hall big band date, and add some swinging' and heady lyrics to Monk tunes. Take a walk on the creative side with us when "Monk Meets Junius." And note: the Monk runs deep - better get your tickets soon! A fundraiser featuring the Junius Courtney Big Band, R&B artist Miki Howard and the Dynamic Miss Faye Carol. Proceeds to benefit Vallejo High School’s hosting the Dance Theatre of Harlem. Hang out with the band amidst the highest-profile sailing scene on the planet. The stage is enormous, and the pavilion is located in an enormously beautiful setting on the SF waterfront. Snacks, drinks and killer views. We’ll provide the sounds. Denise Perrier is back in town from her New Zealand tour, and we’re flying on the water, just like those AC72s. Comfy lawn beanbag seating provided. The band returns for its annual summer scene at this great neighborhood hang. "The Holidays at Duke's Place"
Your hottest holiday invitation has arrived! The band with Denise Perrier heats up YOSHIs Oakland for their fifth, twice-yearly adventure. The band's new show "The Holidays at Duke's Place" features selections form the Ellington- Strayhorn Nutcracker, plenty of other Duke/ Strayhorn collaborations, and the camaraderie of Thad Jones, Mingus and the Count. Denise Perrier, one of the best jazz vocalists on the scene, swings the season into high gear. The band wants to see you and your friends in the house, where the chestnuts are roastin' and the dreidels are spinnin' - so reserve your tickets now, before the house sells out! The full dance floor will be open! The band with Denise Perrier is pulling out all the stops to update Junius’ historic society dances and tea dances with the band’s unique arrangements and some new tunes. A special invitation to dancers to stomp our anniversary in! Plenty of comfy seating. Great snacks, too. All ages welcome. Tix: $20.50 in advance, $22.50 at the door: $2.00 discount for Seniors; half-price tickets for those 25 and under. RAY CHARLES TRIBUTE: "Junius + Soul = Jazz"
The Junius Courtney Big Band with Denise Perrier takes the stage at YOSHI’S Oakland to celebrate its 50th anniversary with a special show featuring the great Ray Charles. Paying homage to his epic 1961 album “Genius + Soul = Jazz” and other Count Basie/ Quincy Jones-inflected music, the JCBB will swing their unique spin on Brother Ray’s best. In this special one time only show, expect plenty of the band’s own arrangements, originals, and surprises in the mix. Word is that an updated edition of the “Raylettes” will make an appearance, too. Get your tickets to “Junius + Soul = Jazz” before they sell out! Free. Bring your lawn chair. "The Intimacy of Jazz and the Blues"
An evening of smokin' sounds at a great club with old-school ambiance. Free. Bring your lawn chairs. Check the website for table reservation info. CD RELEASE PARTY AND DANCE! With a brand new CD to release—US—and a big dance floor to fill, there's plenty to celebrate, and the Junius Courtney Big Band wants you in the house for a Saturday night party! Celebrate with us, get out on the dance floor, and pick up a copy of our fresh CD with as many autographs as you'd like. We're rolling up the carpet and clearing out the front rows of seats to create a dance hall worthy of Harlem's Savoy, while the band raises the roof with renditions from our new recording, including smart arrangements of "(Stompin' at the) Savoy" and "Sunnyside of the Street" plus a stack of tunes you'll only hear live. There will be plenty of comfy seating for dedicated listeners, and for dancers taking a break. The Junius Courtney Big Band rounds out February's African American History Month with sounds and soul that are at the heart of the music. Create some history together with the band at the release of this swingin' CD, and become a part of US. Tix: $18.50 advance; $20.50 at the door; $1.00 senior discount. Easy parking at the Allston Garage (Allston betweenMilvia abnd Shattuck), the Center Street Garage, (Center between Milvia and Shattuck) and other locations, including the street. RESERVE YOUR TIX AND SEATS NOW! The Junius Courtney Big Band, featuring Denise Perrier, returns to YOSHIs with a summer show celebrating Quincy Jones. The band revs up with some of Quincy’s arrangements for his own all-star orchestra, spotlights his work with Ray Charles and Count Basie, and offers a taste of Quincy’s funky/ Michael Jackson side. The extraordinary globe-trotting vocalist Denise Perrier, just back from New Zealand and New Caladonia, puts her indelible stamp on the Quincy Jones songbook. This will be the band’s fifth appearance at Yoshi’s, and promises to follow the suit of their previous sold-out, stomping engagements. Reservations encouraged. All ages welcome. Excellent snacks and full dinners available. The new CD "US" will be available in the lobby. "TRIBUTE TO EARL "Fatha" HINES"
Featuring some of Hines' own arrangements, the Junius Courtney Big Band's take on some of Hines' signature tunes, special presentations of small group numbers, including the Earl Hines-Louis Armstrong classic, "Weatherbird," AND the exceptional piano work of special guest TAMMY HALL. The Junius Courtney Big Band with Denise Perrier swings back into YOSHIs Oakland on Tuesday, December 20th. It’s an especially good year to be home for the holidays, and we’re inviting you to come by and raise a glass with us. We’ll be pulling out some fantastic standards, adding some festive holiday numbers, plus a few surprises to keep the season fresh. Make your reservations soon for a relaxed and swinging “Home for the Holidays” show at the best club around. The dance floor will be open for business when the Junius Courtney Big Band with Denise Perrier hits the bandstand for their first appearance at the New Freight! Plenty of comfy concert seating will be available, too. The band is in powerhouse mode, propelled by sold-out shows at Yoshi’s. The Freight’s brand-new location has a great dance floor, ample seating and terrific acoustics, while retaining a hint of the funky allure from its beloved former location. The snacks are top-notch and the staff is friendly. This will be a swingin’ night to top off February and prolong those Valentine’s tendencies. 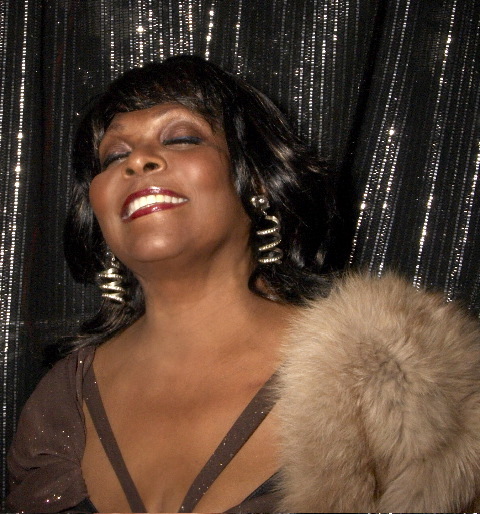 Denise Perrier fronts the bill and the band at the up-scale and glamorous RRAZZ ROOM in The City. There will be plenty of swinging surprises at this afternoon of Jazz High Tea. Denise Perrier’s burnished contralto, thirty-year international singing career, and unstoppable charm infuse this hot jazz session with authentic soul. Don’t miss this opportunity to check out Denise Perrier with the Junius Courtney Big Band: the experience of an exciting full jazz sound in a comfortably intimate setting -- Jazz @ the Rrazz. Validated parking at the adjacent Mason-O’Farrell Garage. Revivial of the hippest! The Junius Courtney Big Band returns to the Shattuck after about a 25 year hiatus! Catch this band that “swings with power and concision” (per critic Andy Gilbert) as it sways the chandelier in the Crystal Ballroom. “The Past is a Thing of the Future” at the newly refurbished Hotel Shattuck Plaza. "It Might As Well Be Swing: Basie's In The House"
The Junius Courtney Big Band, featuring Denise Perrier, pulls out the stops for “It Might As Well Be Swing: Basie’s In The House” on Tuesday night, June 8th. Nat Courtney leads the 19-piece ensemble through two shows (8:00 and 10:00 pm) of Basie’s tunes plus band originals and swingin’ arrangements, all Basie-infused. Denise Perrier revisits the influences of Ella, Sinatra and Joe Williams. The Junius Courtney Big Band sold out both of its dates at Yoshi’s last year, so reserve your tickets now. Just two short blocks from the New Montgomery BART station! Richmond's "Music on the Main"
The band returns for a Swingin' Solstice on the Longest Night of the Year. Ellington-Strayhorn-Nutcracker-Swingin' Holidays-New, Cool Yule. Reservations encouraged. All ages welcome. Refreshments available. Light up the longest night of the year with the Junius Courtney Big Band and Denise Perrier as we return to YOSHI's for a two-show Holiday Party. Featuring selections from the Ellington-Strayhorn version of the Nutcracker and a jazz celebration of the season. Our June YOSHI's show SOLD OUT, and we want to make sure you get in to this one! The Band's Debut at Yoshi's with "The Arrangers' Showcase"
We turn the spotlight on in-house jazz arrangers for one long set of sophisticated and unique portrayals of standards and originals. Topping the arrangers’ list is the late, great Jerry Cournoyer, noted for creating complex and swinging harmonic and rhythmic innovations. Arrangements from the late Junius Courtney, the band’s founder, Roberta Mandel, the band’s long-term pianist, Frank Fisher, trumpeter and blues-drenched godfather of the band, and others will be showcased. Vocalist par excellence Denise Perrier and the 18-musician-entourage promise to swing down the house. The 19-piece Junius Courtney Big Band, featuring Denise Perrier, performs their original dramatic staged reading and jazz concert, “The Billy Strayhorn Session,” at the San Francisco Public Library in a free performance on Saturday afternoon. Doors open at 2:30 pm. The concert celebrates the life and imagination of Billy Strayhorn who, usually credited as Duke Ellington’s arranger and collaborator, was a music master in his own right, a courageous black gay man, and an active civil rights supporter. Strayhorn’s life is portrayed in speaking roles by Denise Perrier as Lena Horne, bandleader Nat Courtney as Duke Ellington, and musical director George “Jazzbeaux” Spencer as Billy Strayhorn. The full band performs Strayhorn’s original compositions that illustrate his emotional and musical depth while swinging down the house. 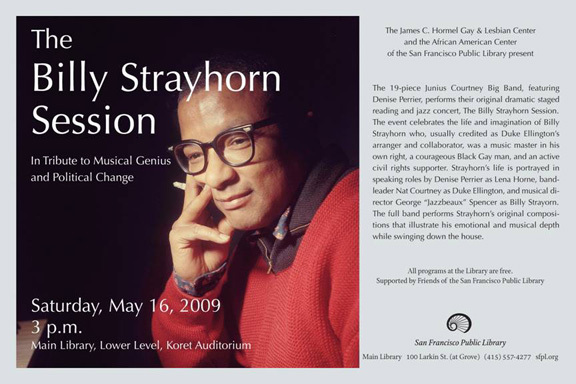 San Francisco Public Library’s centers, the Hormel Gay and Lesbian Center and the African American Center are bringing the life and work of Billy Strayhorn into sharper focus through the lens of music and history. For more information, contact the San Francisco Public Library at (415) 557-4400. Mail order tickets available until April 12th via check payable to Sojourner Truth Church Choir, and mailed to 2621 Shane Drive, Richmond, CA 94806. Purchased tickets can be mailed or made available at “will call.”Tickets also available from Sojourner Truth Church members and friends. The full band with Denise Perrier out front on vocals delivers valentine messages of exuberance and romance in a special concert, "Love Letters in Jazz." Come celebrate the swinging passion of love as the band sends out stompers like "I Cain't Stop Loving You," heart-rending ballads like "Tenderly," the latin side like "Un Historia De Amor" and the delirious "Come Fly With Me." Extend your Valentine's weekend with a night of red-hot jazz at the friendly venue of the Freight and Salvage, where refreshments are plentiful and all ages are welcome. Jump-start your holidays with a Sunday night dance! The City of Richmond, the Richmond Chamber of Commerce, and the Rosie the Riveter/WWII Home Front National Historical Park are teaming up again to bring you the Homefront Festival. Thursday, September 11, 2008, 6:30p.m. Saturday, August 23, 2008, 8:00p.m. Sunday, August 24, 2008, 3:00p.m. Saturday, August 16, 2008, 7:00p.m. Friday, August 8, 2008, 12:00p.m. Bring your lunch and park in the garage. Saturday, June 7, 2008, 1:00p.m. Sunday, March 30, 2008, 3:00p.m. Your swingin' alternative to afternoon tea. The Junius Courtney Big Band returns to the very happening venue at Anna's with new material and plenty of swing. Come early for prime seating. You can park in the Allston Way garage, 2061 Allston Way (between Shattuck and Milvia, just a block west of Anna’s ) for only $3.00 with our validation. Saturday, March 22, 2008, 7:00p.m. Thursday, March 13, 2008, 6:00p.m. Benefit for Emery school Music Fund. With special guest, multi-grammy winner, Narada Michael Walden! Saturday, February 9, 2008, 8:00p.m. The 19-piece Junius Courtney Big Band, featuring Denise Perrier, returns to fill every square inch of the Freight and Salvage stage. Adding to their swinging execution of a roof-raising repertoire, the band presents a special set, "The Billy Strayhorn Session." Celebrate Africian-American history at it's swingingest with the notes of Strayhorn, Ellington, Basie, Thad Jones, and the Junius Courtney Big Band. Door 7:30 P.M., Music 8:00 P.M.
Sunday, December 2, 2007, 3:00p.m. Your swingin' alternative to holiday shopping. Saturday, December 8, 2007, 8:00p.m. Celebrate the holidays with friends as you enjoy the sounds of The Junius Courtney 18 Piece Orchestra. There will be contests, prizes, and light supper and a no host bar.